In the center for migrants transiting the Red Cross via del Frantoio 44 , Giorgio de Acutis, head of Migrants project, presents us with a bunch of guys. 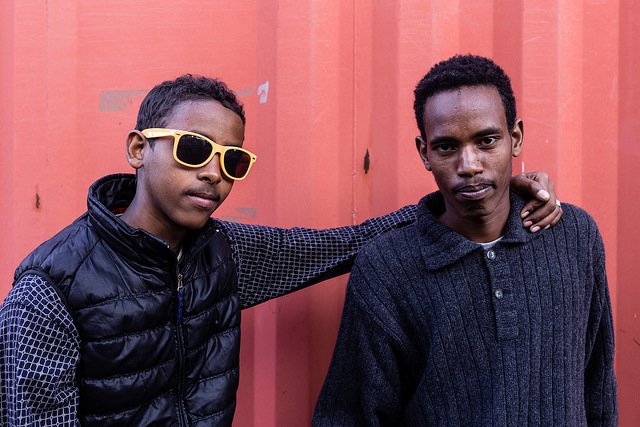 ” I am especially Ethiopians : is the novelty of the last two weeks,” explains George. The first to speak is Miftah Abdalnaer. Dall’Oromia is, a region of Ethiopia, the specification immediately. “It should be 25 years old but he is not sure why Ethiopia, away from the cities, the births are not recorded,” explains Adam, a former journalist now a translator for the Red Cross, which mediates in the center. Since here Miftah decided to take the responsibility to inform the world about the situation of his ethnicity. It took about 8 years to decide to leave , and he did it because he wanted to find freedom in countries such as Australia or America, and sensitize the world community about what was happening in his country. The, however, have taken the fingerprints in Lampedusa and, according to the Dublin Regulation, it had to remain in Italy. 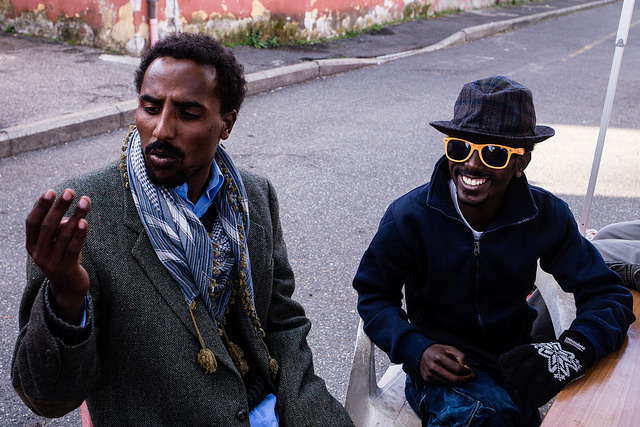 “I shot several prisons in Libya and have been sold to traffickers”. To get out of jail you have to pay big money and he could never afford them. Fortunately he managed to escape. “The problem of the Oromo existed for centuries, but in recent times the situation has plummeted,” he concludes. The Oromo ethnic group, despite being the largest in the country, corresponding to 32% of the national population, for centuries has been discriminated and persecuted, but from 2014 the problems have increased due dell’Addis Ababa Master Plan : the city, enclave of ‘ “Tiger” in the ethnic Oromo territory, has launched a project that, in behalf of the government, has embarked on a massive seizure of land, most of which were sold to foreign countries. This resulted in the loss of work for most of the Oromo, mainly farmers. But this situation will not work and students have raised the remaining farmers, with demonstrations that were harshly suppressed. In particular, in November 2015, the police responded to a Oromo event by opening fire: 140 people killed. It is estimated that from 2014 are 5,000 imprisoned Oromos , on suspicion of opposing the government. The prosecution, in most cases, is that of terrorism. A crisis that appears to be the largest suffered by Ethiopia after the carnage that followed the 2005 elections. Silent against this dictatorship, which, unfortunately, in the West there’s little information, Aga Yusuf Mohamed, president of the Oromo community in Italy, and his group organized the January 14 an event in Rome in Piazza Montecitorio .Other demonstrations took place in Brussels. “The European Union must stop funding Addis Ababa, feeding a system in which dissidents are tortured and imprisoned and their property confiscated” – supports the Oromo leaders. For this was drawn the Democratic Manifesto of the oppressed people of Ethiopia addressed to the Italian Government and to sensitize the international community on the situation of ethnic dictatorship of the “Tiger” in Ethiopia. On 21 January, the European Parliament passed a resolution condemning the use of force against the Oromo, the lack of respect for civil rights and calls on the Ethiopian Government to avoid all forms of ethnic and religious discrimination. It remains to be seen whether this decision and the recent promise by the Ethiopian government to withdraw the Master Plan following protests will translate into reality or remain only good intentions without result.